We at Bizboro.com have a vision of Local Business's that will participate in Online advertising. We are Brand New and are dedicated and willing to Promote this site which can include your Business. 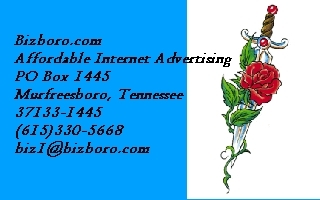 By being UNIFIED we believe that Promoted correctly Bizboro.com will be a common name in the Murfreesboro area. We believe that the Internet will continue to grow and each household will soon be connected on-line. As Bizboro begins to take its growth, we will continue to offer more and more services. E-Commerce is alive and we at Bizboro will continue to grow along with the technologies.. We will Promote Bizboro.com to all the major Search Engines. Also with your subscription we will submit your page's to the major search engines.. Promotion is essential and we at Bizboro will continue to submit Bizboro.com as time goes on. Our Goal here at Bizboro.com is Simple, we want to Promote and Maintain a site that is geared to be used by Rutherford and surrounding Counties. Because of the vastness of the World Wide Web your pages can be viewed by anyone in the world with access to the internet.. A great tool for Local Business's. A site that will be heavily promoted and generate income for all participating. It is our job to Promote this site which will in turn Promote your Business. We will do our best to KEEP IT SIMPLE by coming to Bizboro.com for your on-line advertisement we pledge to put our efforts in Maintaining a Professional and Courteous Site. Dedicated to making Bizboro.com a Popular/Common site in Murfreesboro Tennessee. We will have a Top Twenty section that will rotate yearly. If you are one of the Top Twenty subscribers we will include your page in this area of our site. This Top Twenty Section will be on all of the Category pages A thru Z. On January 1 every year these Top 20 Sites will rotate off to the next twenty.